And speaking of countries… Now that it’s gone global, which countries have the most users on Facebook? 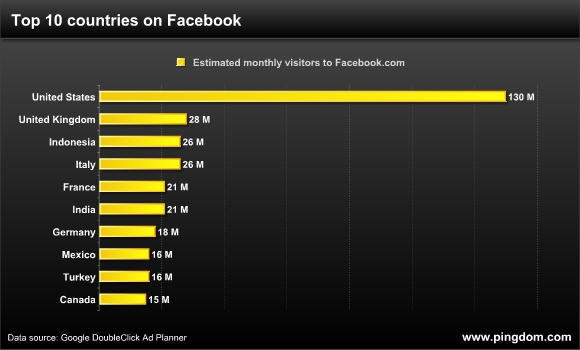 Google Ad Planner estimates worldwide monthly visitors to Facebook.com to 550 million. This is slightly higher than the 500 million active users Facebook says it has, but on the other hand, not all visitors to Facebook.com need to have an account. Still, we’ll use the 550-million number in the calculations here below to be consistent (i.e. to avoid mixing data from different sources, which can give misleading results). The United States alone accounts for almost 24% of Facebook’s users. 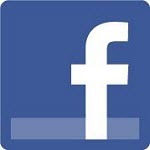 The United States has 4.6 times as many Facebook users as the second-largest country on Facebook, the United Kingdom. The top 10 countries on Facebook account for almost 58% of its users. The rest of the countries account for the “long tail” that makes Facebook the colossus it has become. Facebook’s international expansion is well under way, and it’s arguably the largest and most wide-spread social network that ever existed. As Facebook grows on a global level, the current US dominance of the social network will gradually diminish and become more similar to the general distribution of Internet users. Mark Zuckerberg has stated that it’s almost a guarantee that Facebook will one day hit 1 billion users, and at the current rate, it’s certainly looking possible. Considering there are close to 2 billion Internet users in the world, there’s still plenty of room to grow. “If Facebook were a country, it’d be second only to China and India.” Ummm…doesn’t that make it third? Do you also have a ranking by % of total population or % of a country’s online population? If “drinking water” was a country, it would be the largest in the world! Why do people always compare websites with actual countries that have physical land, governments, and citizens. If you want to remove your facebook account, you simply delete it. If you wanted to become a citizen of another country, it takes more than a couple clicks. That analogy is getting old and irrelevant. Roughly in line with what you have, but my figures suggest that you are overstating Italy and downplaying Turkey. There seem to be one or two others skewed too. wow. my country (malaysia) at the 11th place. I dont think it’s 50% for Indonesia (population 200 million) and India (1billion people) due to the low broadband penetration. don’t think malaysia have 12 million, you can do a more accurate estimation by using facebook ad targeting. it should count to about 6 ~ 7 million range. we have reported these hate, violent and propaganda pages and their violent photos to Facebook yet they remain. Wouldn’t it be more telling if you had the percentage of facebook users to the total population of a given country???. I wonder how this affects the productivity of these countries. why PAKISTAN is not mention in the rank ? Yes,my country India is 2nd ranked.